Huy-Binh Le, Seung-Tak Ryu, Sang-Gug Lee, “An 84B DR Audio-Band ADC with a Single Power Supply Port for Compact Digital Microphones,” submitted to CICC 2009. 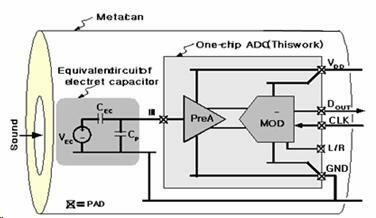 Huy-Binh Le, Seung-Tak Ryu, Sang-Gug Lee, “A Fully On-chip Gm-Opamp-RC Based Preamplifier for Electret Condenser Microphones", IEICE Trans, Electron, VOL E92-C. No.4, Apr. 2009. Le, H.B. ; Nam, J.W. ; Ryu, S.T. ; Lee, S.G.;, “Single-chip A/D converter for digital microphones with on-chip preamplifier and time-domain noise isolation" IEE Electronics Letters, vol. 45, Issue.3, pp.151-153, Jan.29 2009.